Click on the part you want to read and skip the rest if you want! NAMIBIA/BOTSWANA/ZIMBABWE: THE BEGINNING OF MY TWO MONTHS TRIP IN AFRICA! Three unforgettable weeks, the beginning of my dream journey, marked as a tattoo in my heart forever. In the title, I mentioned my one week in South Namibia, but I actually experienced 3 awesome weeks with Wild Dog Safaris, from Namibia to the mighty Victoria Falls. Since the post would have become massive, I am going to write about the rest of the trip in two more posts! There are brilliant people like Anthony Bourbain, who can easily encapsulate my feelings in just a few incredibly powerful sentences and then… there is me, staring at a blank page for months, completely speechless! After I came back from Africa in January, I had so many emotions and memories inside that it took me forever to process them all. As a matter of fact, I don’t think I will ever be able to fully express what this trip has been to me, at least not with words. And this is super frustrating. People who know me well, are aware of how hard it is for me to write about Africa. I took a million pictures and so many of you fell in love with them, but when it comes to writing. I get hopelessly stuck. In addition to my emotional turmoil I also had some delicate personal issues I had to deal with and I didn’t want them to affect me when writing about this incredible experience. Now that I’m – hopefully- “issue free” I’m ready, and no matter what it will come out from this post, I want you to know that this might not be the best piece of literature out there, but my heart will be in every single word I’ll write. It’s been more than eight months since I was weeping on a bench outside the airport in Daar El Salam – Tanzania, waiting to board the first of 4 flights that would have brought me back to Europe. I still remember that final car ride from my hotel to the airport as it were yesterday. I was aware that this was the last time I would see the African continent for who knows how long, so I kept my eyes glued to the window, trying to capture as many details as my mind could possible handle. Saying goodbye to Africa was one of the most difficult things I had to do since I started travelling the world. Hands down. It was almost as painful as a breakup. Yesterday I went through my facebook posts, looking for the hundreds of African Pictures and updates I had put up until now on my social media and a few of them still gives me teary eyes. My first picture in Africa: The incredibly beautiful and surreal colours of Namibia! This photo was the very first I published on Facebook after I landed in Namibia, filled with excitement, like a kid who sees the world for the very first time, and this was –accidentally- also the last one I put on Facebook before boarding that plane back home. THE BIGGEST DILEMMA: HOW AM I GOING TO EXPLAIN MY AFRICAN EXPERIENCE TO YOU?! I thought a lot about the way I wanted to tell you about this trip. What to do? Just write a recap of what I did, with useful tips for all the people who are still asking me –non-stop- how to organise their trip to Africa? Should I divide my story across 8 countries in chapters and separate articles? Wouldn’t it be better to just disregard my emotions and get straight to the facts? You see my dilemma. The reality is, almost one year later I’m still completely overwhelmed. It’s incredible how many things can happen in 2 months (inside and out) when you travel. And I just realised that it will be impossible to leave my emotions at the door. It would mean going from Clelia to a bad copy of any travel guide out there. And this is not what this website is about. So, you know what? Screw it, when it comes to Africa, I’m going to write whatever comes to my mind, trying to make sense of it all, mixing the emotions with tales, misadventures and useful tips for you. When I write a blog post I certainly want it to be useful for you, and I will give as much info as I can, but it’s also important for me to pass you my emotions and feelings before the information. My aim is for you to imagine being in Africa with me, right now, as I go back there with my memories. It took me months of effort and a good amount of positive stress to put this trip together, from finding the right companies/Tour Operators for each country, to deciding the right itinerary, booking the internal flights and transfers, dealing with vaccinations, visas, and much more. No matter how hard it might be to decide which country or countries you want to visit, or how much money you will be able to spend: If there is a trip that you shouldn’t miss for anything in the world, Africa is THE ONE. Am I biased? Well, of course I am, I loved Africa to death and this is my story, but I suspect that if you ask around you’ll find many other people who would completely agree with me. Ok, before I start digging into my emotions and memories, let’s start with the basics questions I get all the times: Which countries I have visited and what I saw/experienced. You can find most of the info regarding the itinerary on my pre-trip emotional article “I’m going to Africa in 2 days!”, the only thing missing in there is the part about the Seychelles, as I didn’t know about it yet. To make things easier for me and for you and avoid being overwhelmed when telling you about this experience I will go in chronological order. This article will be all about my first week in South Namibia, part of the three spent on The 23 days Odyssey trip with the amazing crew of Wild dog Safaris (more on the whole three weeks itinerary below). A word to them: Guys, you are super passionate in everything you do, I miss you so much (van included!). I truly can’t recommend them and their tours enough. What can I say… there couldn’t have been a better start for my African adventures, what a wild ride it’s been! First night camping in Namibia. Do I really need to comment on this?? I have no words. Really! The skies in Namibia will leave you speechless. Below is the recap of the places I’ve visited during my three weeks camping under a million stars and moving with a big van throughout three of the most incredible countries in Africa: Namibia, Botswana and Zimbabwe. Reading once again the list of the places I’ve visited gets me every time, and you can probably understand why is taking me so long to process it all, considering that this list doesn’t even cover an entire month out of the two I’ve spent in Africa. This is the official itinerary for our 3 weeks camping around Namibia, Botswana and Zimbabwe. It really has it all! You have no idea of how badly I wanted to do this tour! I still remember jumping up and down in my bed the day they confirmed I was in for the dates I wanted. 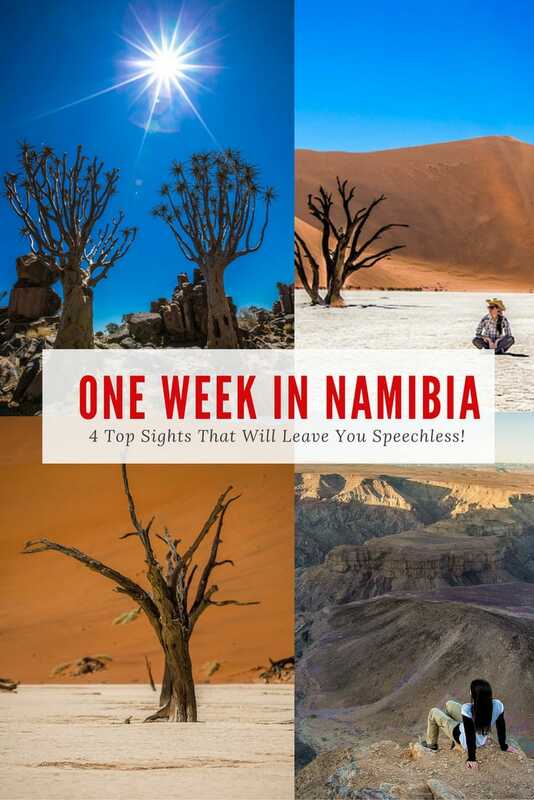 NAMIBIA: WHAT KIND OF EXPERIENCE SHOULD YOU EXPECT WHEN TRAVELING OVERLAND AND CAMPING? Wild Dog Safaris has a dedicated page where everything is explained very clearly and in great detail, from tipping the guides to advice on safety, equipment provided and more, so that you won’t have any surprise. Check it out in HERE. I was well aware that an overland camping trip is more physically demanding than a normal tour and it’s not everyone’s cup of tea, but I happen to love camping and even if they give you the opportunity to upgrade to a standard room near the campsite, I didn’t even consider that option. I wanted the real deal. Setting my tent every evening, sometimes fighting against the winds from the desert, feeling the power of nature around me. I thought that by starting my 2 months in Africa camping and moving by road was perfect as first of all, it was a true adventure in the wild and, secondly, because I thought I would be fresher and have more energies to spend. Unfortunately, if you already read my blog you know that I’ m rather delicate when it comes to my health (I caught the flu on my flight to Namibia). But worry not, this is only my Bridget Jones side! I had such an incredible time with a mix of super fun people from all over the world: young people, retired couples, singles, everyone sharing their love for adventure, sitting around a bonfire for dinner and exchanging stories and experiences under the Namibian sky. I couldn’t have asked for more. It was perfect. Every night after dinner, I used to place a sarong in front of my tent, lay down and watch the stars, being fully aware of how lucky I was to be there. This type of trip might be more tiring than a normal Safari trip, but totally doable for everyone who loves camping and the outdoors. The campsites are basic (and that’s the real beauty of it!) but provide toilets, most of them electricity and some trees to give the tent shelter from the sun during the day. Disclaimer: If you are not into camping at all, Wild Dog Safari is now also offering the option to book directly an accommodated trip in lodges. So are you ready to come back with me in Namibia??! Read on! I experienced the 21 Days Tour, which is a combination of three tours: the 7 days South Namibia, 7 days North Namibia and the 9 days via Botswana and Zimbabwe to the Victoria Falls. You can book the trips separately. For info on the following tour, click HERE. At sunset it will leave you breathless! First day of my Namibian trip. Sunset over the Kalahari Desert! The day after my arrival in Windhoek, I started the epic 7 days Namibian South Tour. Bridget Jones side apart, I will never forget that day! During my first game drive in the Kalahari desert, I spotted my first giraffe accompanied by a cute baby one, as well as colourful birds and zebras. 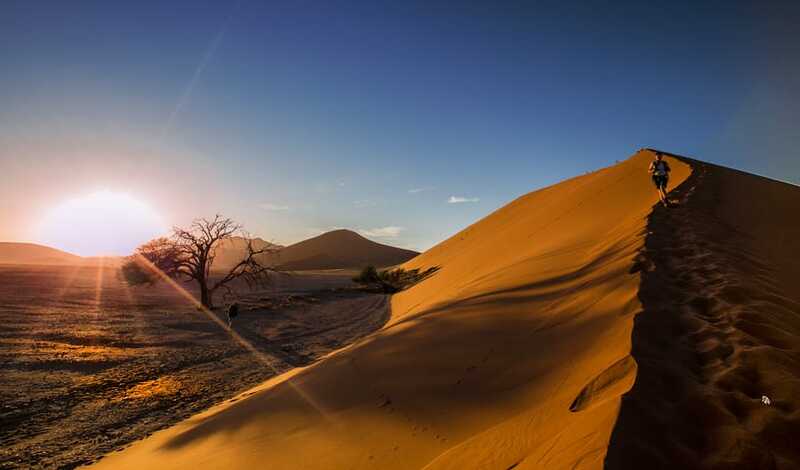 I will also remember the Kalahari for its unforgettable sunsets over the typically red dunes and acacia trees, making it one of the most fascinating places to visit in Namibia. This was also the first time I ever set foot in the desert, an emotion so big that when I think about it, my heart feels like it’s about to explode. Only one day had passed since I landed in Namibia and I was already madly in love with this surreal country. Here I am, happy like a puppy, on our first stop during the 7 days tour in South Namibia! That first day we also crossed the famous Tropic of Capricorn sign, with a sky so blue and a soil so orange that I thought I had just landed on Mars. A landscape that would leave anyone speechless for at least a few second. On the right, a big empty road waiting for us, full of promising adventures! The picture with the sign is a rite of passage when visiting Namibia, almost like being baptised to Africa, or at least it was for me 🙂 What a surreal place, besides our van, no one else was there, only the typical red soil meeting the bluest sky I have ever seen in my life and the Namibian endless horizons ahead! 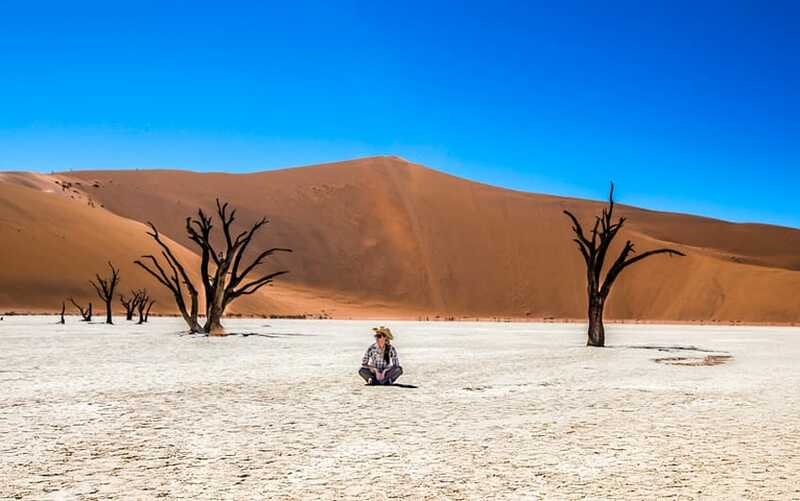 Namibia is a huge country with a population of just over 2,3 million, so it is very common to not cross paths with other visitors. I took some pictures sitting in the middle of big roads more than once. Ok, I won’t recommend it, but really, you can see a car arriving when it’s still kilometres away from you! A Must see, especially at sunrise! One of Namibia’s Top Sights: The Fish River Canyon at sunrise. Another photo that brings tears to my eyes. Definitely one of my dearest ones (out of the 300K I took in Africa, no jokes!!). It is very easy to get there, no hiking required, this magic sight is readily available and suitable for everyone. Believe it or not, we were the only people on the site when we arrived. I was puzzled, in a good way, as I couldn’t understand how a place this beautiful wasn’t invaded by tourists. As usual, words fall short in front of such a majestic view so I’ll simply use the images. When I took this shot I was shivering badly because of the fever, but I didn’t care. No matter how poorly I felt at that time: the fever would have passed eventually, the memories will last for as long as I live. The peace, vastity and serenity you will experience at the Fish River Canyon will truly transport you to another level of consciousness. Maybe it’s not Nirvana but it felt a lot like it! Ghostly indeed for me, as unfortunately, I didn’t manage to visit it. Next time I won’t miss the ghost city! It is such a massive shame that I missed this surreal place. I’m taking it as a sign that I have to go back because you know…every excuse is good to go back to Namibia once you have seen it. That’s why I was forced not only to skip the visit to the fascinating Kolmanskuppe ghost town in Luderitz, but I also missed the lovely city of Aus and a boat trip to see the penguins. All I was good for was staying in bed (mainly cursing my bad luck) and look the pictures of this fascinating city on Google. 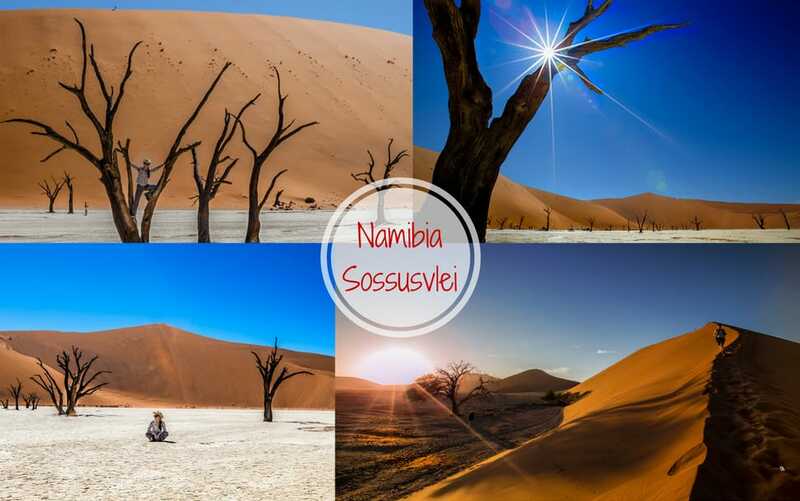 4 | SOSSUSVLEI & DEADVLEI: THE MOST INCREDIBLE LANDSCAPES I’VE EVER SEEN IN MY LIFE! In Search of Incredible? The hunt is over! Sunrise over the Dune 45 in Sossusvlei : OUT.OF.THIS.WORLD. As you can see, I had a good reason to skip a few activities in order to feel better: I didn’t want to miss the next activity, or should I say THE ACTIVITY: Admiring the sunrise from the top of the famous Dune 45 in Sossusvlei and finally seeing the super popular “Death Valley”/Dead Vlei. Just landed on Mars? Nope, this is a collage of shots taken at Dune 45 and later at Deadvlei. The panoramic view is astonishing. When I was on top of the dune, the guides had to call me several times to force me to climb down. I mean, can you blame me?! At some point, I was almost rolling down one side to save my photo equipment, but that’s material for a separate blog post with the many funny accidents from Africa. As usual, I have a very long list! Heck, I would have gone there even if I had to cross the desert on my knees. As I’m writing this and looking once again at the pictures, I can’t believe a place like this really exist and most importantly, I can’t believe I was actually able to see it. Such is the surreal beauty of that place. I remember checking out the pictures online for years thinking that they must have been photoshopped”. Nope, the reality is even better than the pictures! Can you see the vastity of this place? Me on the tree, a super small lady in the background, and if you look carefully, you can see a tiny little person on top of the giant dune behind! That’s how big this place really is. Incredible to say the least. If I had to mention only one spot you can not miss for anything in the world when in Namibia, this is it : Sossusvlei. 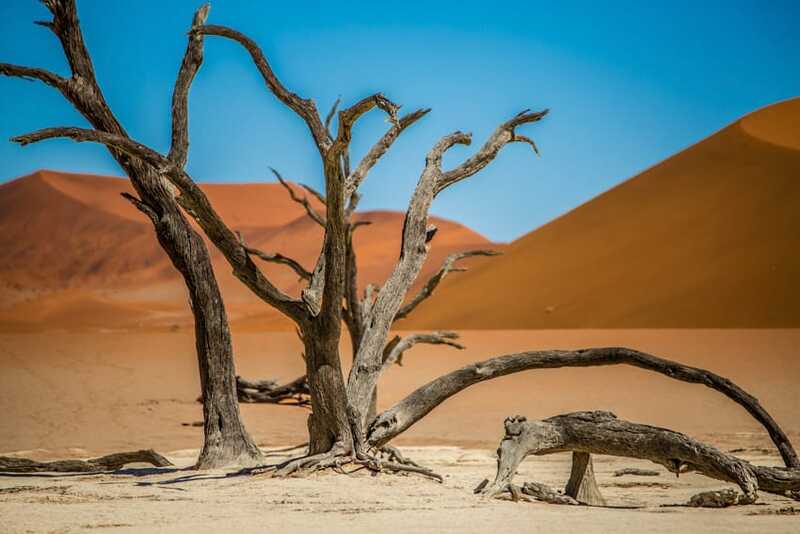 There are no words to describe the surreal atmosphere of Sossusvlei. You need to see it for yourself to truly understand It. When it comes to this place, I’m at loss of words. Even lacking the appropriate vocabulary, I will write a separate article about this location. There is a lot of interesting information for you to know. 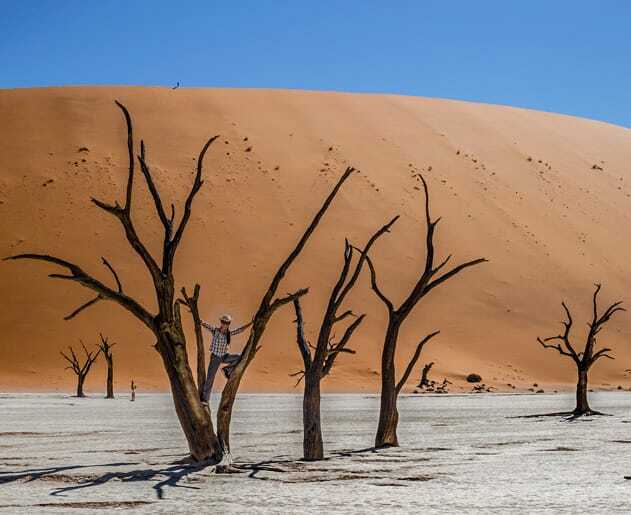 Sossusvlei, the Dead Vlei and Dune 45 definitely deserve a brand new blog post. I have seen some seriously awesome places during my travel, but nothing, and I mean NOTHING compares to this one. 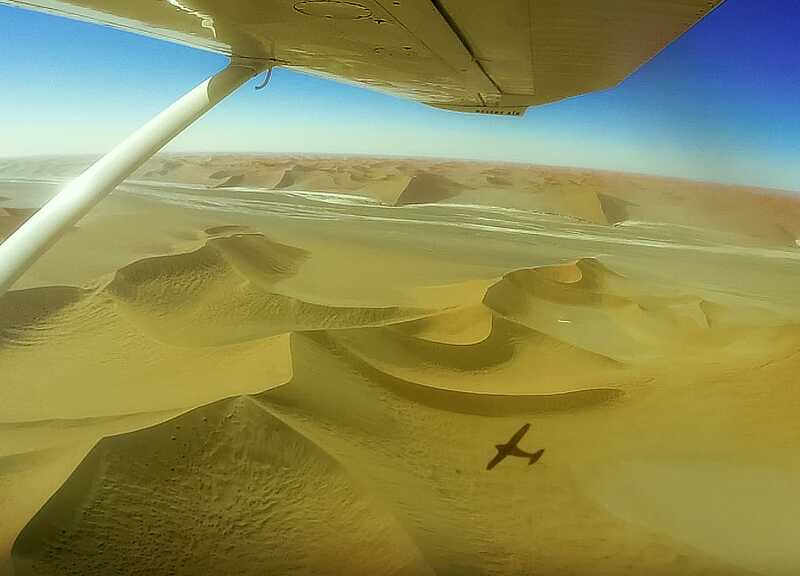 During our stay in the Sossusvlei area, we had the possibility to also enjoy some extra activities, and I was so glad that I wasn’t the only crazy person in my group who wanted to fly over the Namib Desert. They only take you on board if there are at least 2 people on the little plane, and one super cool Canadian lady was up for it and we secured the last 2 spots for that day. Forty-five minutes up in the air brought me back to the movie “The English patient”, I couldn’t stop smiling and slapping my face to make sure I wasn’t dreaming! HIGHLY RECOMMENDED. So, have you ever been to Namibia? If the answer is no, what are you waiting for?! You don’t need a ticket to Mars, just buy one to Namibia and you won’t be disappointed!! *Disclaimer: I was able to experience the beauty of Namibia, Zimbabwe, Zambia and Victoria Falls thanks to Wild Dog Safaris who invited me to join their tour. All the opinion expressed in this post are my own, including the fact that if they didn’t invite me I was still planning to pay for that trip anyway as the price, compared to the services offered is super competitive. I put all my effort to write this for you, like it and make me happy!